The winter holidays may be advertised as one of the happiest seasons of the year, but that isn't the reality for everybody. Like any time of the year, depression, anxiety, loneliness and more can plague the mind, and worsen if not taken care of. Feeling these emotions and dealing with these mental illnesses are completely normal, but may put a damper on the fun to be had. Thankfully, we’ve prepared seven ways to cope and treat yourself, like our favorite duo Donna Meagle and Tom Haverford. Music has such a big impact on how I'm feeling, so picking some tunes to listen to really helps with my mood. For quiet times, I turn to playlists or undiscovered albums. Whether they be on 8tracks or suggested on Spotify, not only do they help to discover new artists, they also help dramatically change my mood. A stressful day ended better when I finally listened to the Hamilton soundtrack. A rather uneventful day took a turn for good when I stumbled upon Tom Misch's EP Reverie. Sometimes, simply just listening to something new is uplifting. When calming down, I've learned to turn to folk or chill R&B tracks, as they're almost therapeutic to my ears. For this occasion, Risen has a few playlists, great for if you’re feeling the holiday spirit, soothing, calm tracks, and more. Feel free to check them out! If these playlists aren't to your liking, then search for some on streaming sites like Spotify, 8tracks and Pandora in genres you enjoy, or even create your own. I personally take ages to make playlists, making an effort to match moods within the lyrics and melodies of the songs picked, but if this interests you, I highly suggest just making a few playlists for fun, and maybe even publishing them or burning them onto CDs as gifts. There's something inherently calming about baking over cooking, something about the excitement of sharing the sweets gets me in a better mood. I've found that baking something you're good at, or trying out some new treat, holiday themed or not, makes me feel a lot better. I know that as I’m part of a Congolese family, my parents barely bake anything western, so I take over that area of food. I’d suggest baking gingerbread cookies, brownies’ cousin blondies or apple crisp. If you're a fan of breakfast foods, try having fun with waffles, making them crunchy or soft, or even trying to make crepes or frittata. These recipes can be made just for you to taste, or to share with friends and family, and can even brighten their days during this season. Whether or not you’re a gifted dancer doesn’t matter; sometimes just jumping around and letting go by yourself, or with friends and family, is undeniably fun. My favorite thing to do is to blast popular rap bangers and jump around with my sister. Whether it be Panda or Black Beatles playing, we feed off of each other’s energies and just have a blast. Dancing can be freeing if you only let yourself go, despite having a talent for it or not. If you’re up to it, I suggest to dance dramatically to sad or contemporary tracks and laugh as you do it! Even look up some videos if you feel, and learn some dance moves. My personal favorites dance videos to watch are 1MILLION, and if I’m feeling up for a challenge (and willing to pay attention to subtitles) Matt Steffanina uploads easier choreographies to follow. If you have a Wii and any Just Dance, they also prove to be fun! Making art, no matter how small it is and no matter your talent, is always therapeutic. I always find myself forgetting pressing issues when I make collages, take pictures, and write poetry. The great thing about art is that anyone can make it and it’s subjective. If you want to paint, do it! You feel like trying your hand at embroidery, go ahead! Art, although it may be expensive at times, doesn’t always have to be complicated or thought through beforehand, just do it! If you aren’t up for it, then look for DIYs, make moodboards, put on makeup for no good reason - Pinterest and Instagram give tons of inspiration, if you're feeling artsy. Writing has always been my outlet, and I’ve noticed that many of my peers don’t have the same exact way to pour their emotions. When writing on paper, in ink, my emotions - my loneliness, sadness, depression or however I’m feeling - fills up the page and most of the time releases me of words or situation currently bothering me. It’s as simple as that, sometimes. 06. Take care of your body! Especially if you live in an area where it's cold, taking a bath or simply just washing your feet helps tremendously. Sometimes using face masks or just nice smelling soap on your body, then soaking in hot water is just what is needed for emotionally draining days. Stores like Lush, Bath and Body and more have plenty of soaps, lotions, bath bombs and more to help add scent and make a whole lot of difference. I know personally, that scrubbing my feet or taking care of my face for over two minutes makes me feel a lot better about myself and calms me down. 07. Watch movies or TV shows! Watching bad or light-hearted TV shows and movies are a given during this season. Once winter break hits around here, my family and I are always drawn to cheesy Lifetime movies, iconic holiday films and bad TV shows. When this time of year rolls in, I love binge-watching shows like Scream Queens, Dance Academy, Teen Wolf and Boy Meets World or movies like the first Home Alone and Bring It On, Sixteen Candles and 10 Things I Hate About You. If you aren't into watching anything, I would suggest listening to podcasts or reading novels or comics. If you're a visual person, reading online comics like Check Please! or Spaceboy is great, but if you prefer audio, podcasts like Shade Zine’s, Lore or Welcome to Night Vale are some of my favorites. 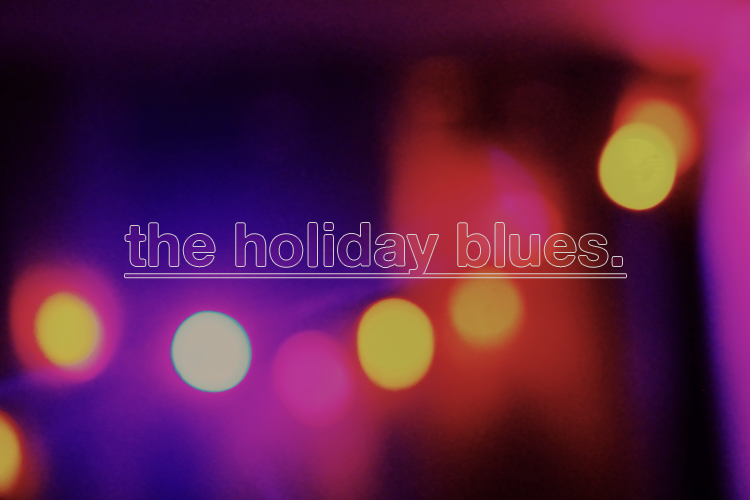 All in all, the holidays may push happiness unto everyone, but that has no say in how you feel. Please don't feel the need to overexert yourselves. Take the time to rest and take care of yourselves if needed.